We recently did an article on the MagicBands earlier in the summer. Here is the latest, with recent updates. This article comes from Orlando Attractions Magazine and is by Matt Roseboom. MyMagic+ is the name of a new “next-gen” system Disney has been working on and hopes to fully release within the next few months. Once fully launched, Disney resort guests and annual passholders will be given MagicBands to wear, which will unlock their hotel room (resort guests), get them in the parks, allow them to charge food and merchandise to their account, collect PhotoPass photos and book FastPasses (AKA FastPass+) ahead of their visit (or the day of their visit). Right now, most everyone staying at certain Disney World resorts will be given MagicBands to use throughout their trip. We received ours by booking a night at Disney’s Pop Century Resort. About nine Disney resorts are currently testing them. More are expected to be added over the next few months until they are at all Disney World resorts. We found the MagicBands and FastPass+ convenient and easy to use. All aspects of MyMagic+ was working except for adding your PhotoPass photos to your account. The only problem we encountered was when we were given a bonus FastPass+ at the Magic Kingdom. The bonus was given to us with a ride time of 12 a.m. to 1 a.m., which was fine because the park was still open, but because it was after midnight, the FastPass+ system was showing it as being for the next day. We were able to resolve the problem with a guest services cast member. We’ve put together a FAQ (Frequently Asked Questions) list and we will update it as things change or new information is released. Remember, MyMagic+ is still in testing so just because things work one way today, doesn’t mean they will be working that same way tomorrow. How can I get a MagicBand? Right now, you can only get one if you’re staying at a Disney resort that is testing them. Once launched, all guests at all Disney World resorts and all annual passholders will get one for free. If you book more than 10 days ahead, your MagicBands will be sent to your house. Otherwise they’ll be waiting for you at your resort. How can I get a MagicBand if I’m not staying at a Disney Resort? Do they cost anything? The MagicBands will be free to all Disney resort guests and annual passholders. Other guests will receive a card as their park ticket. Those guests may upgrade their ticket to a MagicBand for a small fee. What can I do with my MagicBand? How do the MagicBands work? MagicBands use Radio Frequency (RFID) technology and can be read by short and long-range readers. In most cases, you’ll touch your MagicBand to a touch point at Disney World (most look like Mickey heads) to activate it. If the Mickey head lights green, you’re good to go. What can the MagicBands do that card tickets can’t? Because the MagicBands can be read by short and long-range readers and the cards can only be read by short-range readers, there will be certain “magical” things that will happen only for MagicBand wearers. For example, your name may be said to you in an attraction or by a character or some other personalization may happen somewhere in Walt Disney World as you walk by. Can annual passholders be a part of the test? Yes, if they book a stay at a Disney resort that is part of the test. Will the bands continue to work for annual passholders after their hotel stay? Yes. Once their annual pass is linked to their MagicBand, they can continue to use it and book FastPass+. How secure are the MagicBands? Can my credit card or personal information be stolen? Just like most RFID chips, it’s likely someone could walk by you with an RFID reader and copy the information on your MagicBand or pass. But your credit card and personal information aren’t stored on the band or card. Only code is stored. Disney’s readers use that code to look up your information, which is stored in their secure database. Also, to make a purchase, you have to enter a four digit pin number, which you previously set up. Do I have to give my personal information? To take advantage of some of MyMagic+ features and benefits, you’ll need to give Disney some personal information when you sign up online. But if you don’t mind losing some of the benefits, you can opt out of giving them some of your information or all of it. You can also opt out for your children. When paying using MagicBand, how will I get my passholder (or other) discount? Right now, for Passholders, DVC members and cast members to get their discounts, they’ll still need to show their pass/card ticket. What if I forget to bring my MagicBand to the park? You’ll still be able to get in the park and use some of the MyMagic features using your card pass. Can I use my ticket/pass instead of a MagicBand, or opt out of getting a MagicBand? You’ll get one automatically when booking a stay at Disney’s resorts but you don’t have to use it. With the new system, you can have multiple MagicBands and card tickets all connected to your account. They will all work independently of each other. But keep in mind that you may not get some of the MagicBand benefits if you don’t have it with you. Can I stop my child from being able to charge on their MagicBand? Yes. You can set who can charge and who can’t when checking in at your Disney resort. Can I reuse my MagicBand on my future visits? Yes, but you may automatically receive a new MagicBand when you make Disney resort reservations. The online site and My Disney Experience app let you manage multiple passes and MagicBands. Can I give my MagicBand to someone else to use? You’re not supposed to. It won’t work for getting someone in the parks because all guests still have to scan their fingerprints or show ID. You could give it to someone else to use your FastPass+ reservations, but you’re not supposed to. What sort of MagicBand accessories are available? Disney sells buttons, sliders and sleeves for the bands. Click Here to see our video of how to use the accessories. Yes, you can wear it in the pool, rain or ocean. You can also leave it on the dash of your car and it should to be OK.
What size MagicBands are available? There is only one size available but it is supposed to fit on the wrists of 95 percent of guests. Kids and those with small wrists can peal away part of the band to make it smaller. What do the bands feel like? Are they hypoallergenic? They’re smooth, flexible and made of a non-latex hypoallergenic material. What MagicBand colors are available? You can get red, blue, green, pink, yellow, orange or gray. How do I chose which color Magicband I want? If you book your Disney resort stay about 10 days ahead of time, you can customize your MagicBand by choosing the color you want and the name you want printed on the back. What do I do if I lose my MagicBand? If you lose it, you should immediately go to Guest Relations or log onto the app and disable the band you lost. But even if someone finds your band or steals it, they can’t make purchases with it unless they know your pin number. 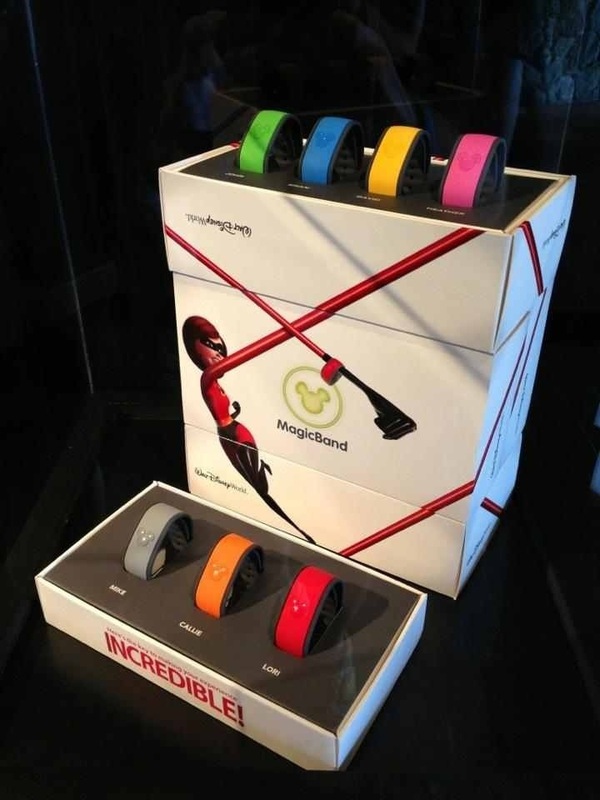 Will the MagicBands work at Disney parks outside of Walt Disney World? No, not yet. Walt Disney World is the only place they will work. Other Disney parks, including Disneyland in California, still use paper tickets. Will my MagicBand do anything outside of Walt Disney World? The only feature we’ve seen so far is in the Disney Infinity video game. Touch the MagicBand to the base and the Disney Dragon appears. Click Here to see it in action. How many attractions can I book per day with FastPass+? You can book up to three attractions per day, but they must all be at the same park. All three must be from whichever park you chose that day. Can I used the FastPass+ program if I don’t have a MagicBand? UPDATED 9-3-13: If you’re not staying at a Disney resort and you don’t pay the fee to upgrade your card ticket to MagicBand, you should still be able to link your ticket to the My Disney Experience app and book FastPass+. How far ahead can I book FastPass+? You can book your FastPasses 60 days in advance. Do I have to choose my Fastpass+ selections ahead of time? No, you can choose them when you get to the park at one of the many stations they have set up around the park or through the My Disney Experience app. Can I change my FastPass+ selections? How do I do it? Yes, you can change them anytime up to your FastPass return time at one of the many stations around the park or through the My Disney Experience app. Can each person in our group choose different FastPasses? Yes, you can choose the same FastPasses for everyone in your party at once or individually. Where do I go in the park for help? Cast members will be available at Guest Services and at the kiosks around the parks. Can I book FastPass+ and use the old Fastpass machines? Will the old FastPass system remain after FastPass+ is fully launched? Disney hasn’t said for sure. Our guess is the old FastPass system will be going away once FastPass+ is fully launched. Do the FastPass+ reservations still include a time window for me to be there? Yes, you will be given a one-hour window to return to the attraction in most cases. What happens if an attraction I have FastPass+ booked for goes down? You will be given a different FastPass attraction, which you may change. You will also receive an e-mail telling you it’s no longer available. Will guests be able to figure out the FastPass+ system? That’s a good question. We will see how hard it ends up being for most guests. But Disney has set up a FastPick system which can automatically suggest FastPasses selections for those who can’t decide. Will FastPass+ service make the attraction standby lines longer? Disney says they don’t expect the standby queues will be any longer than they were before FastPass+. The old system had 28. The new one has more than 60. Disney has added FastPass+ to many attractions and experiences that never had it before, including some quick service restaurants. Why did they add more attractions than the old Fastpass system had? Only Disney knows for sure, but we’ve heard this will help even things out at the more popular attractions. If only the most popular attractions were available, they would all fill up quickly. But with many guests not knowing ahead of time which rides will most likely have long lines, they’ll just pick FastPasses for the attractions they most want to see. This should help spread the selection out among all the attractions. Why do I need a FastPass for a parade/dining, etc.? This allows you to have a guaranteed spot for whatever you book. You can reserve a FastPass+ for a parade or fireworks show and not have to sit on the curb for hours for a great viewing spot. You can get a FastPass for Be Our Guest quick service at lunch and not have to wait in line. NEW 9-3-13: Will some FastPass+ reservations be available for every attraction each day or will those who book ahead get them all? Disney hasn’t said, but we expect they will hold some back from being booked until the day of. But like the current FastPass system, FastPass+ reservations for the more popular rides may be gone at various times each day. We will continue to update it as things change and more information is released. If you have any questions not answered here, post your questions below and we’ll do our best to answer them and add them to the list. How far in advance are you allowed to pick your bands and when will they arrive prior to your visit?